The Deluge Fire Company was one of the City’s earliest volunteer fire companies, formed at the American Saloon on August 6, 1858. Along with the Union Hook and Ladder Company (1859) and the Tiger Engine Company (1860), they fought fires in the young City of Victoria. There was much rivalry between the companies as they raced to burning sites hoping for “first water” and bragging rights. Deluge used this site until 1900; the tower formerly used for the alarm bell and for drying the hoses, was dismantled by 1904. When the streetcar came by in 1907, the building was home to G. A. Richardson’s dry goods firm. 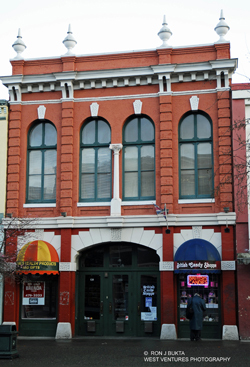 In 1995, the building was restored to accommodate retail on the main floor with offices above. The restoration included: replication of the finial urns above the parapet, washing and painting of the existing brick work, repair of existing second floor wood sash windows, replacement of wood window sills, replacement of the wood cornice above the ground floor, removal of ceramic tile on existing brick piers, removal of the cast iron column in the centre of the ground floor, fabrication of new brick piers, new fiberglass arches to simulate the original stone work, ad new granite bases, new wood framed storefronts and doors. The project won a commercial restoration award from the Hallmark Heritage Society.